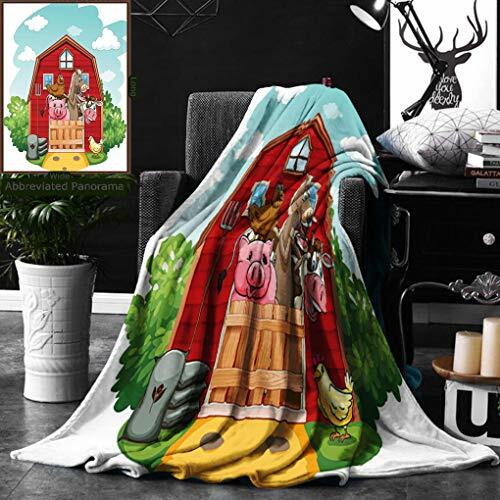 Unique Custom Double Sides Print Flannel Blankets Cartoon Decor Collection Happy Farm Animals Living In Barnhouse Chicken Pig Horse Dome Super Soft Blanketry for Bed Couch, Twin Size 60 x 80 Inches by Ralahome at Animal Backgrounds. MPN: BHD180804RH-17160-150x200. Hurry! Limited time offer. Offer valid only while supplies last. This Premium Plush Blanket Is Double Sides Printed With Elaborate Pattern. It Is Perfect For Homeowners With Sophisticated Tastes In Decoration Home.